FANS: DON'T GET STUCK WITH YOUR STICKERS" Why put up with inferior printing? Try COTT'S PRESS The appearance of your stationery reflects on YOU! Don't create an unfavorable impression with haphazard printing on cheap paper. 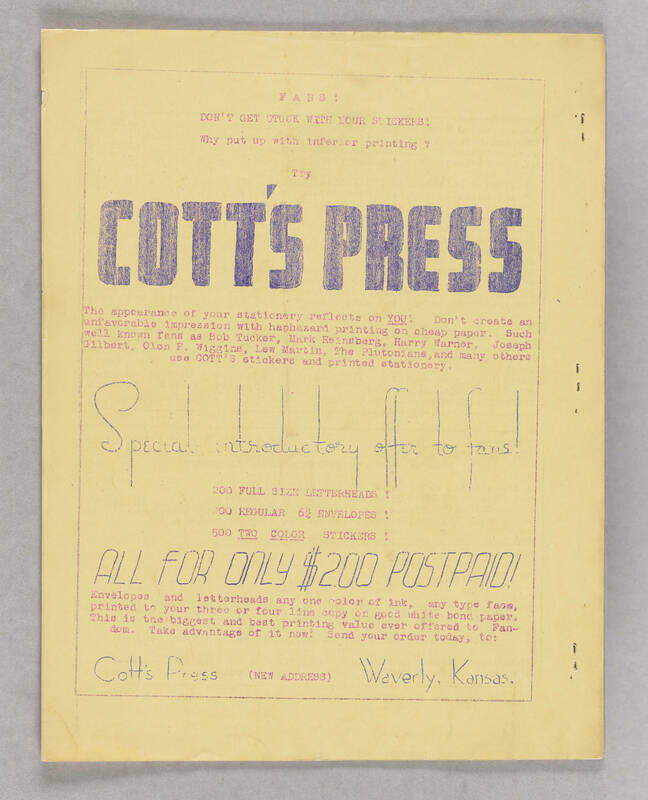 Such well known fans as Bob Tucker, Mark Reinsberg, Harry Warner, Joseph Gilbert, Olon F. Wiggins, Lew Martin, The Plutonians, and many others use COTT'S stickers and printed stationery. Special introductory offer to fans! 200 FULL SIZE LETTERHEADS! 200 REGULAR 6 3/4 ENVELOPES! 500 TWO COLOR STICKERS! ALL FOR ONLY $2.00 POSTPAID! Envelopes and letterheads any one color of ink, any type face, printed to your three or four line copy on good white bond paper. This is the biggest and best printing value ever offered to Fandom. Take advantage of it now! Send your order today, to: (NEW ADDRESS) Cott's Press Waverly, Kansas.